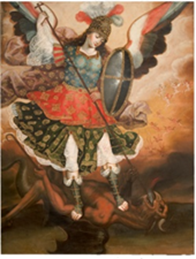 Saint Michael the Archangel (Peruvian, Cuzco, 18th century) Oil on canvas, 79 1/8 x 61 in. (200 x 154.9 cm) Roberta and Richard Huber Collection Photograph by Graydon Wood, Philadelphia Museum of Art. NORFOLK, Va. (Jan. 22, 2018) – Journey to the high plains of South America with Highest Heaven: Spanish and Portuguese Colonial Art from the Collection of Roberta and Richard Huber. On view at the Chrysler Museum of Art from March 2 – June 3, 2018, the spring keynote exhibition will feature more than 100 objects that display the encounter between the rich artistic cultures of Europe and the New World during the 18th century. During the exhibition, the Chrysler Museum will present several programs, including a South American-themed family day and a gallery talk with musical accompaniment. The Chrysler will cater to Spanish-speaking audiences with gallery talks in Spanish. Labels for the works in the exhibition will appear in both English and Spanish. Information will also be available in Portuguese. One of the most significant private collections of colonial Iberian art, the exhibition includes paintings of archangels, carved and gilded sculptures, splendid silverwork and exquisite ivory sculptures of saints and the Virgin. “Highest Heaven shows two worlds coming together and defies the traditional story that the staggering creative energy of ancient indigenous cultures was lost through colonization. Instead, that energy surges through in these works. The iconography is exciting and beautiful,” said Lloyd DeWitt, Chief Curator of the Chrysler Museum. Through the work of both well-regarded masters and anonymous artists and artisans, Highest Heaven highlights the role of art in the establishment of new city centers in the Spanish and Portuguese empires and the propagation of the Christian faith among indigenous peoples. Many of the works were intended for everyday use. Others were created to spur religious faith and to encourage conversion among colonial populations. Especially popular were grand figures of archangels that expressed the power of Christianity. Much of the exhibition focuses on works produced by workshops in the major cities of Cuzco and Lima in modern-day Peru and the silver-mining center of Potosí in modern-day Bolivia, which generated much of the immense wealth that came out of the Spanish colonies. Trade with Spanish and Portuguese colonies farther east in Asia gave the colonies works in ivory. These works underscored the wealth and prosperity of the growing Empire and the reach of European imagery and style. In some instances, European aesthetics and subjects were translated into a distinctly new visual language. In other works, European saints, idols and figures took on the appearance of native populations, enhancing their impact. Together, these approaches created a new visual culture that represented the union of two worlds and diverse people adopting a single faith. “In the context of the Chrysler’s encyclopedic collection, Highest Heaven represents yet another fascinating aspect of global culture that is centuries old. The exhibition is especially relevant to Hampton Roads, because this area is the site of the first encounters of English settlers with the New World and its cultures. We thank Richard and Roberta Huber for their generosity in sharing these treasures with the Hampton Roads community,” DeWitt said. Highest Heaven is arranged according to subject matter or theme with angels and archangels, the life of the Virgin Mary, images of Jesus and the role of the saints. Objects made for secular elites in domestic settings constitute their own section. This exhibition was organized by the San Antonio Museum of Art. Experience South American culture with dance performances, music, hands-on art activities, live animals and more. Also, enjoy art demonstrations by Peruvian artist Carlos Arias, Founder and CEO of Inspired Peru. How does culture change the representation of faith? What happened when Spanish and Portuguese colonists brought their faith to the high plains of South America? Why do the Virgin Mary, archangels and saints play such a large role in this art? Join Virginia Wesleyan University&apos;s Dr. Mavel Velasco, Professor of Hispanic Studies, and Dr. Craig Wansink, Joan P. and Macon F. Brock, Jr. Director of the Center for the Study of Religious Freedom, as they explore these questions. Enjoy exclusive access to an after-hours look at Highest Heaven: Spanish and Portuguese Colonial Art from the Collection of Roberta and Richard Huber. As you explore the keynote exhibition, enjoy insightful commentary from Chief Curator Lloyd DeWitt and music from award-winning violinist Seán Heely. A cash bar will be available before the tour. Tickets: $10 for Museum Members, $15 for all others. Register at reservations.chrysler.org. Visit Chrysler.org for dates and times. The Chrysler Museum of Art is one of America’s most distinguished mid-sized art museums, with a nationally recognized collection of more than 30,000 objects, including one of the great glass collections in America. The core of the Chrysler’s collection comes from Walter P. Chrysler, Jr., an avid art collector who donated thousands of objects from his private collection to the Museum. The Museum, expanded in 2014 to add additional gallery spaces and amenities for visitors, now has growing collections in many areas and mounts an ambitious schedule of visiting exhibitions and educational programs each season. The Chrysler has also been recognized nationally for its unique commitment to hospitality with its innovative gallery host program. The Perry Glass Studio is a state-of-art facility on the Museum’s campus. The studio offers programming for aspiring and master artists alike in a variety of processes including glassblowing, fusing, flameworking, coldworking and neon. The studio has also cultivated a reputation for its cutting-edge performance evenings, and was the host venue of the 2017 Glass Arts Society Conference.